For all the Blue Server lovers - we are back guys!! Recall gave me the final permission tonight and Blue is up and going. This is not a comp server but more geared for pure fun!! Always open to suggestions and our test team will test them and we can put them to a vote if necessary. Come by for a visit!! Nice! Its cool to have more servers, but in America? Im preparing for lag. Sweet - Now you feel our pain sir. = "You are now WANTED Run!!!" Assassins are basically players who are basically part of the other team (appearance is changed, you see all team members etc) but who can still damage the other team and be damaged by them. Wanted mode is where after a player gets 30 kills, they begin glowing and every player on the other team receives a distance meter to the wanted player. There are also some additional heallth rewards for performing special kills, like knife, poison, or goombas. Im so jacked u have no idea right now my computer is currently at my brothers house but will be getting it back shortly, cannot wait to be on the server so pumped to have blue back! The sound pack also sounds pretty awesome lol. Thanks for the IP Kaos!! It should be in the master list as well rt beside the Green Server. Everyone have a great time!! Good idea Owned - That is a Mohawk and/or Recall thing though. I find the hitboxes very weird. Also Panza damage seems very low..
Congratulations on blue!  Got the gametracker banner-codes for ya . I found out that the images won't show with these codes. That's strange. Will look into it. EDIT: found it: had to delete the 'cache' in front of the www. EDIT 2: found out that I had to delete it from the html-codes aswell. Yeah, had the banners but I think Owned meant to put the vertical one on the side like we have Green now. Those don't show because they don't have the proper tags. They are using HTML tags and not the squared Forum tags. Okay thanks again but I don't have forum permissions to put it over there. Do you? Nope. Just wanted to make it easier for da rednamed guys. Time to transfer back home ! Realy great we havw a new server........realy great news! Finalllyyyyy! Count me in to be a Blue'ie! I didn't mean the one on the side, those are not needed imo, I meant the horizontal "banners"
Back in the days of the 'Old-G!X' you had to get permission from the owner of your current server and permission from the Owner of the server you'd like to transfer to, before transfering. Why? Because I'd like to have an up-to-date administration. Best server , nice work ! Another step closer to the best clan in the world.......G!X forever! We all have our roles for G!X! I am just proud to take G!X to the top and all are welcome to have fun with us. To back up Jux, anyone that wants to join Blue has my permission but a PM or xfire message would be appreciated. I'm quite excited to see the future progress of Blue, I'm sure it will prosper! Blue is good server aswell as Green! Reason: I want my good old blue tags backkk! @ Lotus - you need to PM the owners for notification/permission of transfer....not necessarily a forum post. So, this is meant to go in PM's, but this once I'll let it go like this. You have my permission to transfer to Blue. So in this case, asking me or Jux, and Shoot for the permission would be the way to go. Subject: Re: BLUE IS BACK! !